The Joovy Hook is the only deluxe leatherette fabric hook-on chair on the market and I love it! It’s sturdy, super easy to set up and easily hooks onto almost any dining table. The first time I used the Joovy Hook I was impressed with how easy it is to set up right out of the box. That being said, I carefully read through their comprehensive instructions (with great pictures) to ensure I had made all the right adjustments before placing my daughter in the seat. With three clicks of a button on each handle and securing the turning knob at the center of each hook arm, the Hook is ready to use within seconds. I tried the chair out on a few different tables and was happy to see that it is very adaptable; it fits tabletop widths from 1″ to 2″. This makes it a great portable seat for restaurants! 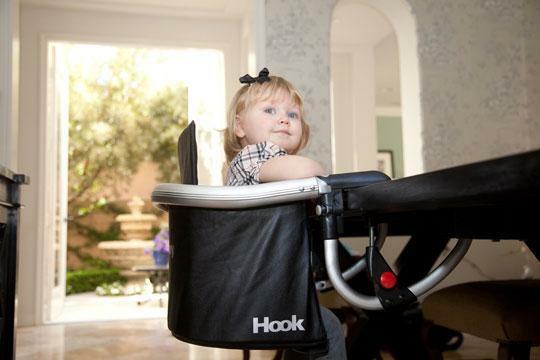 The Joovy Hook can support a child up to 37lbs (approximately 3yrs); my daughter is a 20lb one year old and presently fits nicely into the Hook but I like how there is still ample room for her to grow. With its deep 10.5″ seat and 3 point harness I am confidant the Hook will last until she is ready to sit in a chair by herself. I also like how the 3 point harness securely holds my daughter when she cranes from her seat to grasp for items that are purposely placed out of her reach. Also, when meal time is over I find it super easy to unbuckle my squirming little one and lift her out of the Hook. Meal times are fun and messy times at our house, I was pleased to find the leatherette fabric very easy to clean after having food slopped and dried onto it. 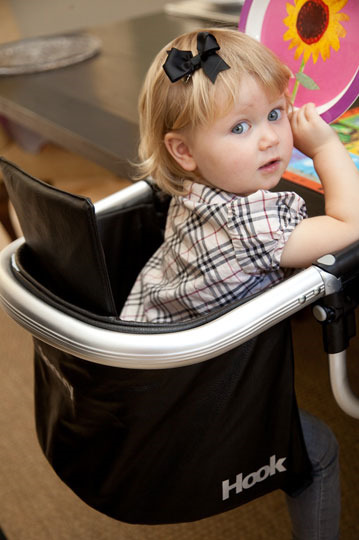 The Hook is a good looking highchair featuring leatherette fabric and an anodized aluminum frame making it super lightweight and strong. The leatherette fabric comes in four fabulous colours: black, white, greenie, and orangie to suit the style of your home. For traveling, the Joovy Hook is super compact and includes its own travel bag. It weighs 5lbs with dimensions of 5” x 15.5” x 13” when folded and was designed to fit into most diaper bags. With simply a push of a couple buttons the Hook is ready to slide back into its travel case, slip over your shoulder or onto your stroller and you are off to new adventures! There is nothing I would change about this product. At USD$69.00 the Joovy Hook is a steal. ABC Kids Expo 2010: LOTS of New Stuff At Joovy for 2011! I am interested in the joovy hook chair but My table has a large skirt on it… from the top of the table to the bottom of the skirt measures 4 inches. will the joovy hook clear 4 inches between its upper arms and the lower rubberized pads when the pads are twisted down to their lowest point?